Disconnect the battery (–) lead wire (1) from the battery. 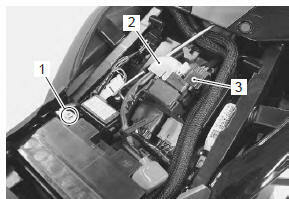 Remove the starter relay cover (2) and disconnect the starter relay coupler (3). 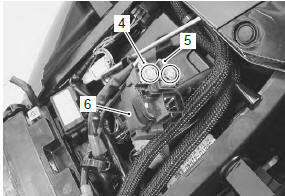 Disconnect the starter motor lead wire (4) and battery (+) lead wire (5). Remove the starter relay (6). Install the starter relay in the reverse order of removal.